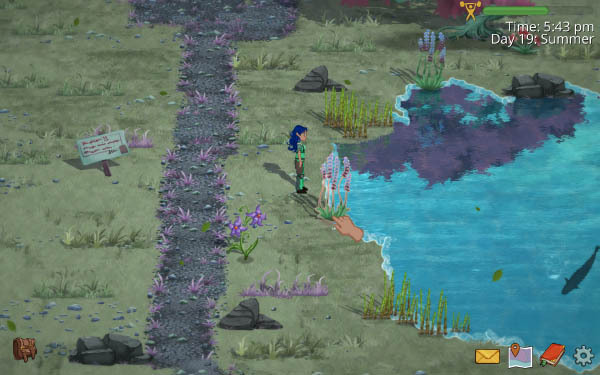 Verdant Skies is a life simulation game for people who grew up loving Harvest Moon and who long for a game that matured with them. 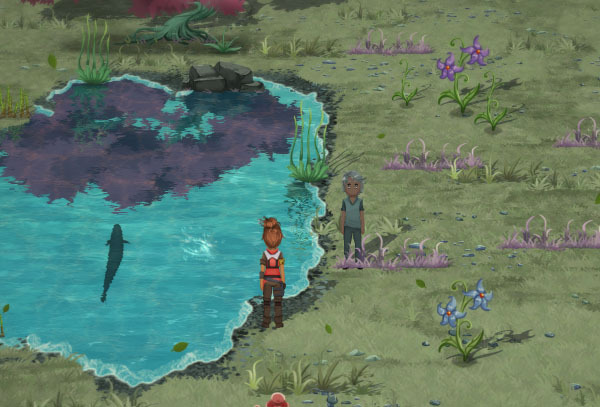 It features a diverse cast of characters to befriend and/or romance in both traditional and non-binary gender role relationships and an advanced farming system with plant hybridization options. I wrote the reflection shader with the help of Scott (thanks Scott!). At first, it started as just a way to animate the water, so the first thing to add was the rippling pattern that occurs on the surface. I won't get too technical here, but if you're interested in details, the core idea is using a normal map to displace your UV texture lookup. Then we composite that reflection map on top of the water that we're drawing. 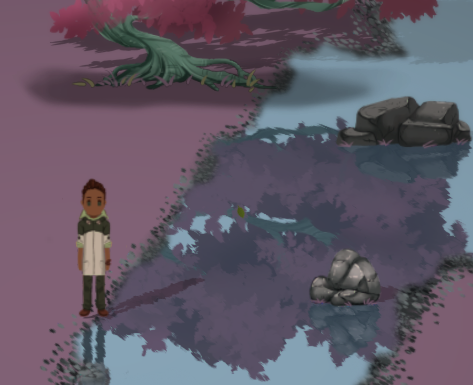 The animated reflections are looking pretty cool, but it doesn't really look like water.. kind of like a shimmery mirror. So we blend in a texture as the last step. Have you ever noticed that when you look across a big body of water and see a reflection, that moving doesn't really change what's reflected there? There's a pretty constant gradient because of how the sky is reflecting in the angle of the water. 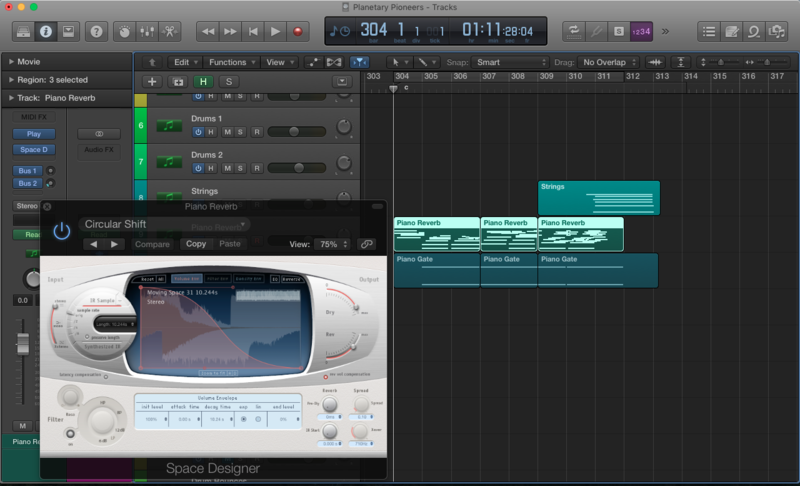 Our team is trying to establish a coherent mood for Verdant Skies and a big part of that comes from Troy’s music. To begin the project, he established a palette of instruments that coalesced around guitar, drums, bass, and organ. Those aren’t everything, but it has done a nice job to establish the frontier-like elements of the game–an untamed wild, expansive and uncharted. The trailer needed to invite the audience in and preview the musical style. For that, Troy decided a piano would be fitting. 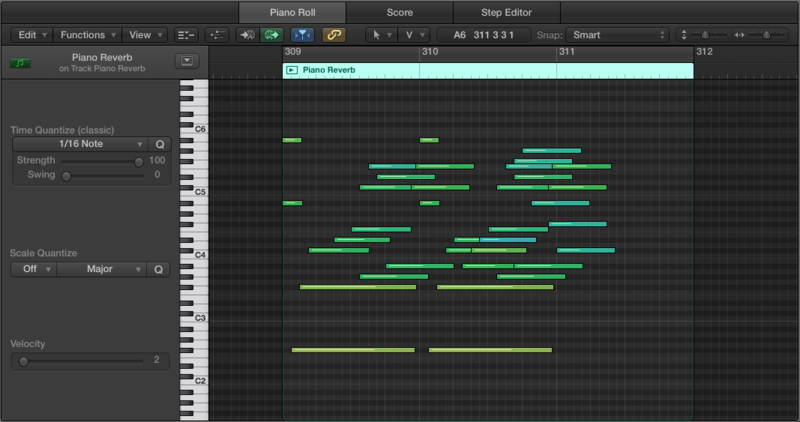 He used the EastWest Steinway virtual instrument treated with Logic’s built-in Space Designer convolution reverb plugin. This lent a grounded yet otherworldly, shimmering sound. He applied a tape delay to the pedal tones as well. To structure the music, Troy focused on the three main scenes: a woman walking along a lake, a man walking through a swamp on an autumn day, and two friends meeting near a grove of trees. Each offered a glimpse into the possibilities in store with the game, so the musical material needed to build as the world opened up. Troy built clusters of lightly articulated piano chords filled with dissonances that didn’t resolve–we don’t know where the next scene will take us, or what we’ll find on this strange world. As it grows in volume and the range increases, we peer through trees to see evidence of a new colony and the Verdant Skies logo as an F# chord plays in the strings. The final four notes utilize the main motif of Verdant Skies: an ascending major 7th followed by a perfect fourth a minor 6th above (in this key, F#, E#, C# & F#–and don’t try to tell him it’s an F natural!). There is lot of exciting audio happening in Verdant Skies, so be sure to check back to hear what Topher Pirkl is doing with sound design and adaptive audio implementation. Andy and Beth will be at GDC for this entire week! 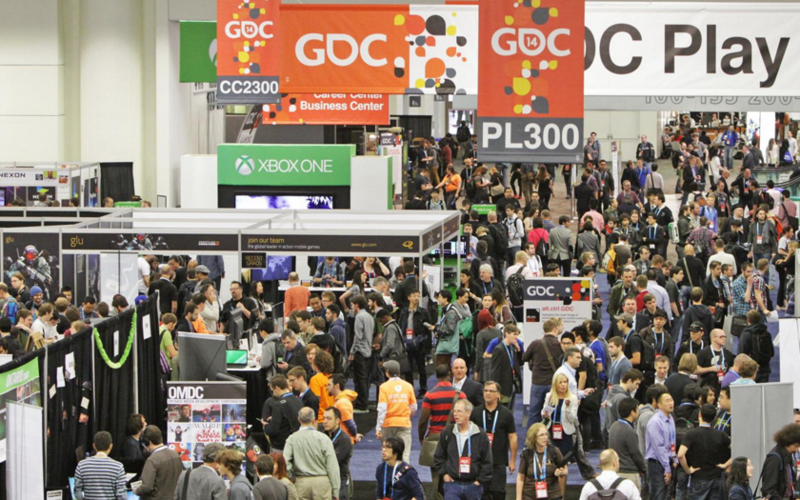 GDC is a yearly game developers conference that's held in San Fransisco- and it's the big one. We’ve been working on updating our player UI. Check out these new icons Lizzy made! These are just some of the basic tool icons you will see in the game. We plan on having upgrade options as play progresses. Each tool will become more powerful as you upgrade it. She also made the correspondence icons for when you receive communications. Last but not least, romance indicators! As your fellow inhabitants fall for you, their level of attraction will be tracked with these gorgeous hearts. 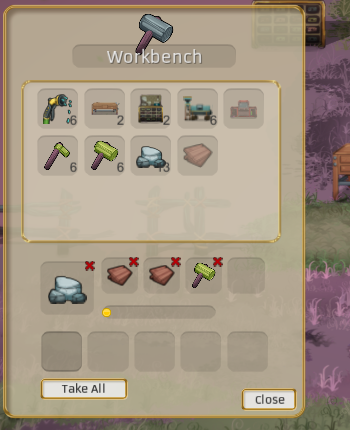 The player can make and place things like workbenches, watering tanks, etc. 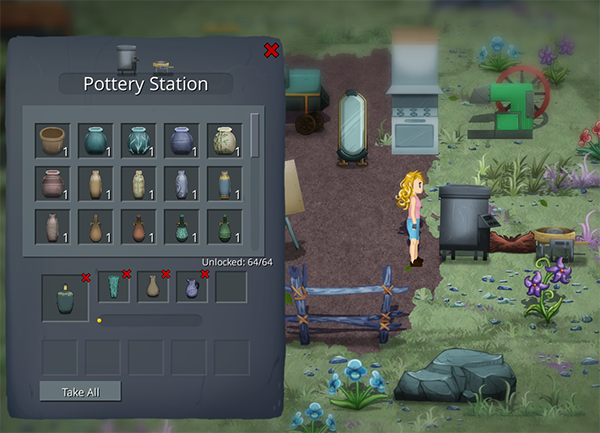 Making and placing these objects is both a way for the player to advance, and it allows customization and ownership of the world. Crafting can take time, so players have an incentive to plan and prioritize what they are making. If they're planning on making a lot of something, additional workbenches/ovens/etc will speed the process. Different crafting stations can be used to craft different things. The UI still needs some clearer labeling, but the bottom row is the output, products that have been made. The large item above that is the one that is currently being crafted. The items to the right are the queue of items that are in progress. It flows pretty well when you see it in motion. When you mouse over the item you want to craft, it shows a description of the item, and what it takes to make that item. Will there be a crafting mini-game? The mini-games in Fantasy Life were great and really well done. 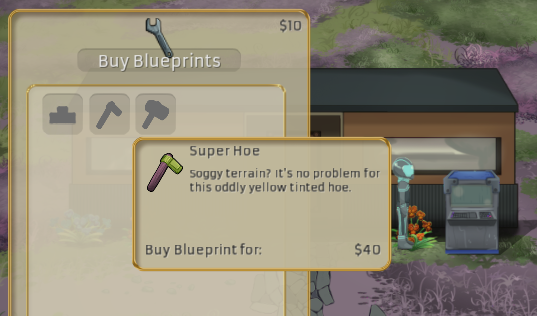 The better you did on the mini-game, the higher the quality of the item produced. One thought is that you only need to do the mini-game the first time you craft something. Or you can skip the minigame to craft at the highest quality level you've achieved so far. Do crafted items have a meaningful quality level? This goes hand-in-hand with the above question. 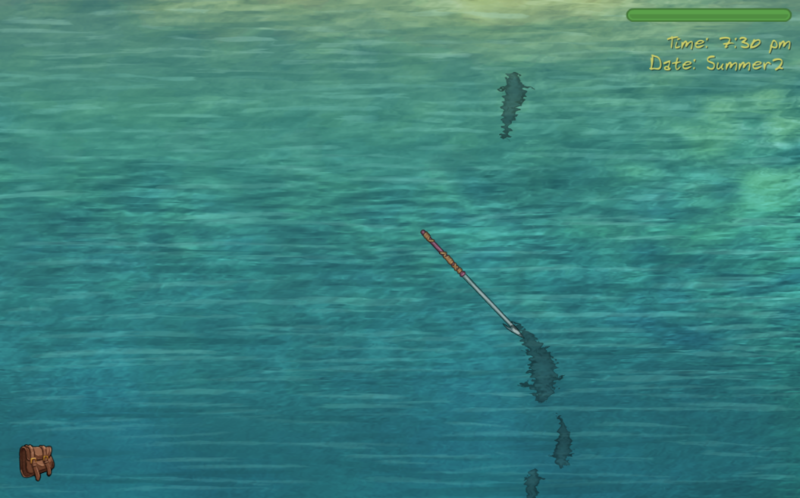 A lot of games in this genre have a fishing system based on waiting for a bobber to move, quickly hitting a key, and then some sort of button mashing to reel in the fish. Most of these mini-games are <em>sorta okay</em>, but they are never too interesting, involve a lot of waiting, and can be pretty inaccessible to people with lower manual dexterity. A major inspiration for the spear fishing is the hunting system from old <a href="https://youtu.be/cPaAHGo-Kqk?t=57">Oregon Trail games</a>. The fishing system isn't 100% finished yet. The size of the shadow of the fish and how far away it is from shore will play a role in determining what kind of fish you get. I'd also like to dress it up with some trail effects on the thrown spear. Also, the fish count has already been reduced to a more reasonable level since the video was taken. 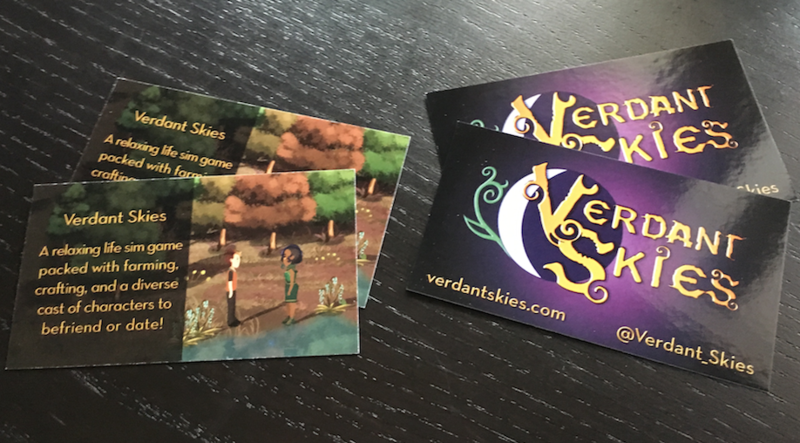 We've been working hard on getting Verdant Skies ready for 2DCon, but the forum posting fell behind a little bit. 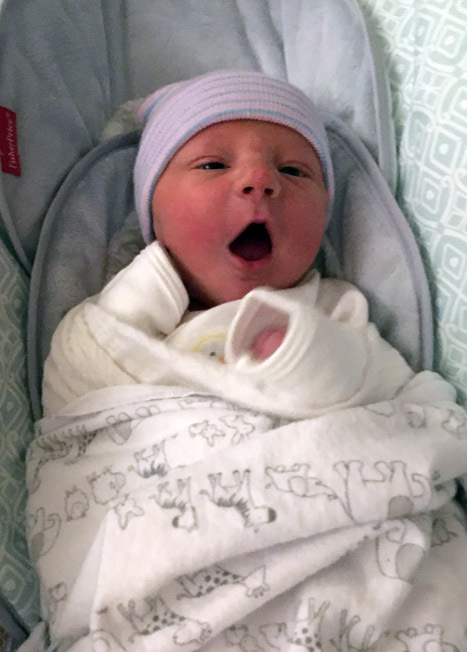 One big reason for that is because we got a new team member! He's about 4 weeks old now, but this picture was taken in the first week or so. Things have calmed down and I've been back at work on Verdant Skies. There's been a lot of fixes to all sorts of areas, improving playability and getting things ready for our first public showing. We also just held our first private playtesting with three brave volunteers at Glitch HQ's Playtest event. The playtest went great, I was expecting about 5-20 minutes of content, but each person played between 25-30 minutes before I had to kick them off! I got about 8 pages of notes, so there will be a lot of usability improvements made by 2DCon. Lots has happened since 2DCon! There's been 38 bug fixes or features added since the show. Another huge thank you to everyone who tested there, provided feedback, and gave us their ideas. Added some of the new style house art that Lizzy made. It looks amazing, and even better- it's customizable. 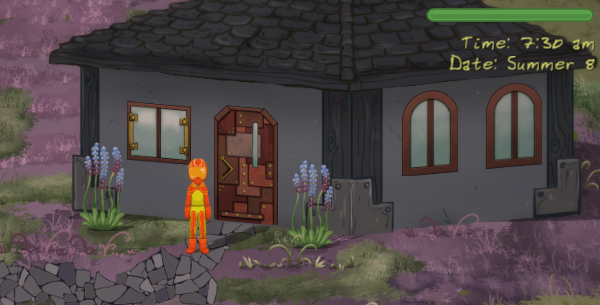 As developers, we can swap out the doors and windows for different styles, and arrange them differently depending on our needs.... and that means that when it comes to the player's house, there are lots of decorating options! * Remove that annoying unclickable piece of scrap by Rosie's house. 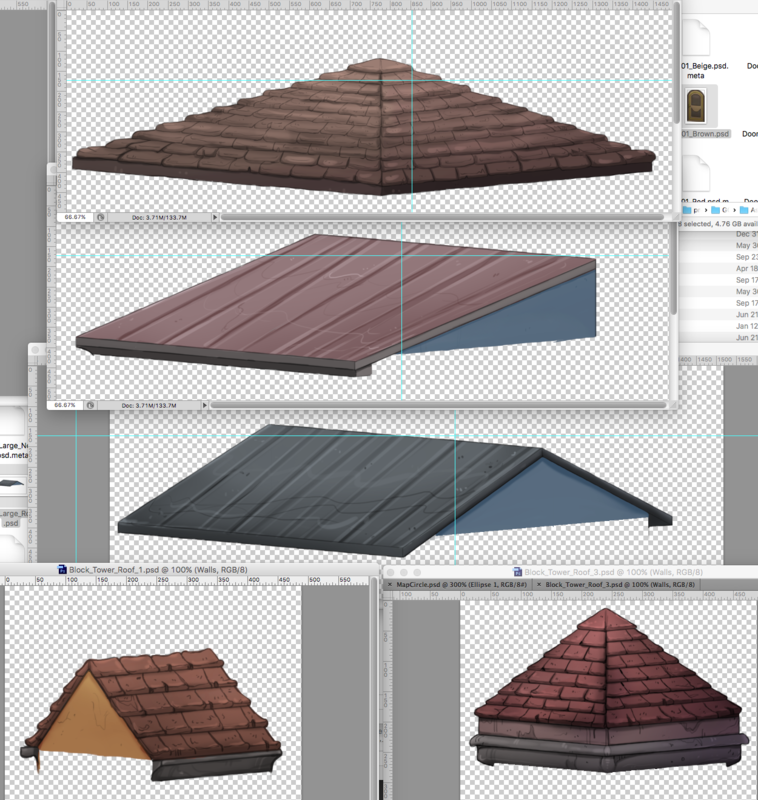 More code and artwork for the customizable house system has been finished! We've got a visual tour of some of the different ways you can decorate your home as you expand it through the different levels. 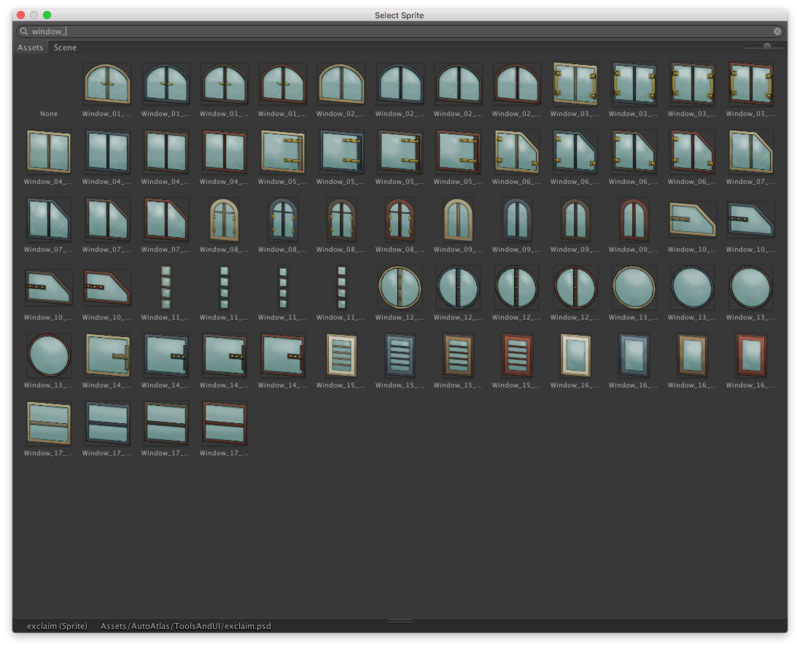 And finally, I wanted to keep the amount of extra popup windows to a minimum, so you can edit the design of your house as you walk around outside it by using the arrows that pop up near each window, door, or at the base of each building. A huge amount of work has been done on Verdant Skies since our last post. The first programming pass has been finished on the in-game map. As I watch new testers play the game, I find that the map makes a pretty big difference in how they interact with other people. Since they can find the characters more easily, they can get the dialog for each character every day, and they get a lot more of that person's story. 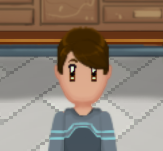 When a character is inside a building, their icon appears above the building! The map wasn't very useful without that feature. 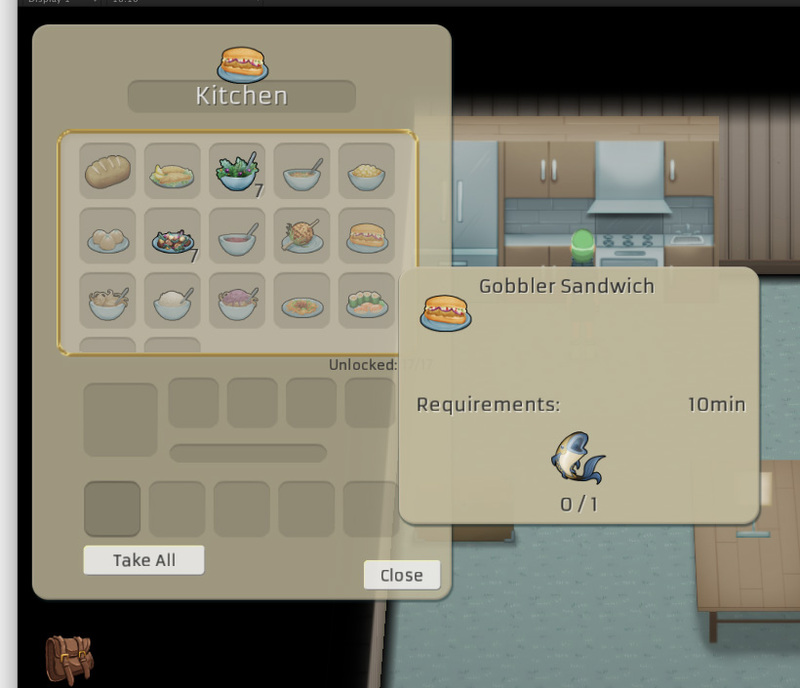 We've also been hard at work on content- like cooking! Lizzy has drawn a bunch of amazing cooked food items. We'll have a special blog post about her artwork soon. Cooking isn't required if you want to sell your food- it doesn't really increase the value of most items... but cooked items can be eaten to restore your energy. So if you really want to pack the most into each day, cooking will be an important part of that. 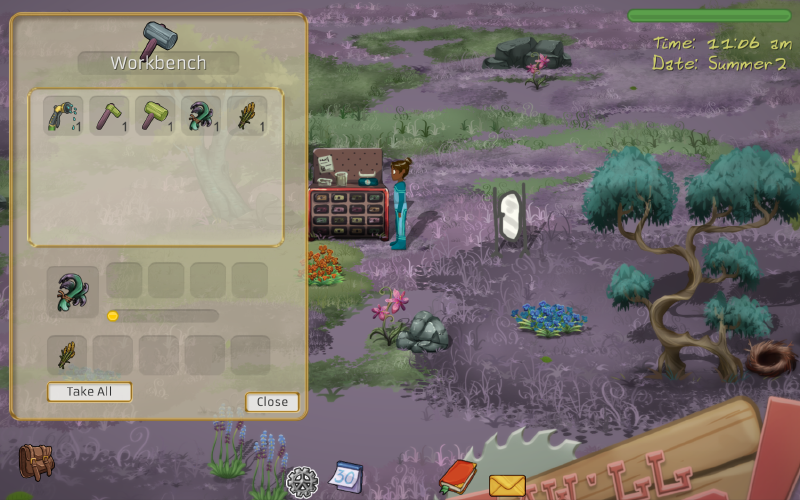 In this image, the player is inspecting a Bristlegrain seed. 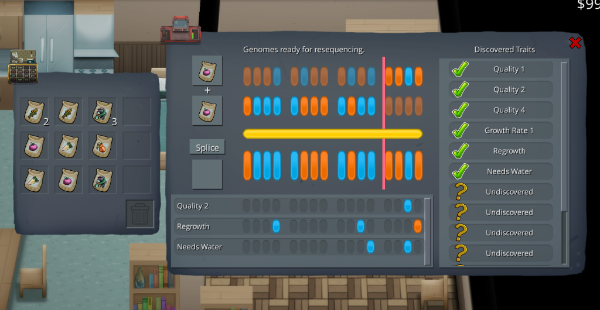 It's genome is represented by the red and green bars at the top of the screen. 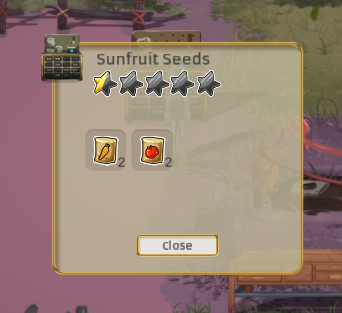 This is a pretty good seed, as it has traits for extra yield and a faster growth rate. You can see how it's genome matches the requirements for the two traits shown. You can also browse the list of traits you've discovered in any seeds. 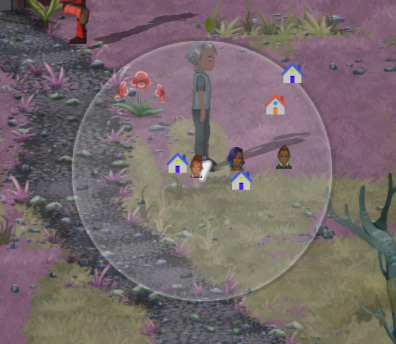 For example, the regrowth trait will automatically replant a crop after it is harvested. 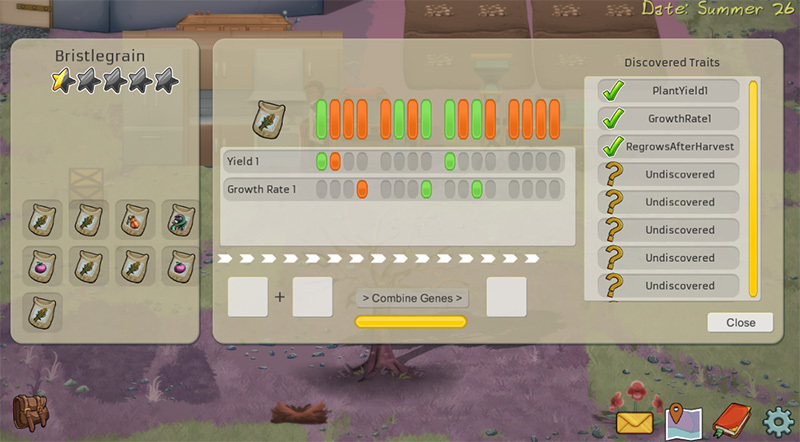 The required genome is shown, so you can attempt to modify plants towards the desired characteristics. Since the last public showing at 2D Con, nearly every aspect of the game has been improved. New music has been composed, artwork has been repainted, game mechanics have been reprogrammed, and new events have been written! For more detailed updates, follow us on Twitter and check the blog. 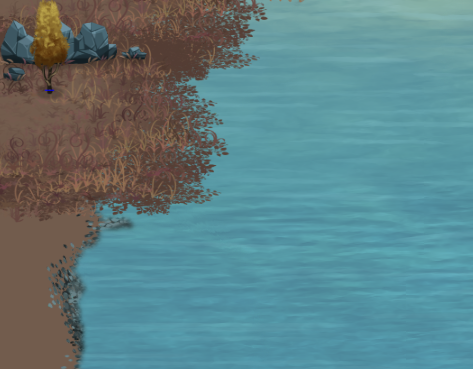 Updated the water graphics- it reflects sunlight as it shimmers and the foamy shoreline moves in and out slowly. New weather system! Rain storms come through at random times during a day and water all your crops for you. While our exterior environment was strong at 2D Con, many small adjustments were made to improve the cohesion of the world. 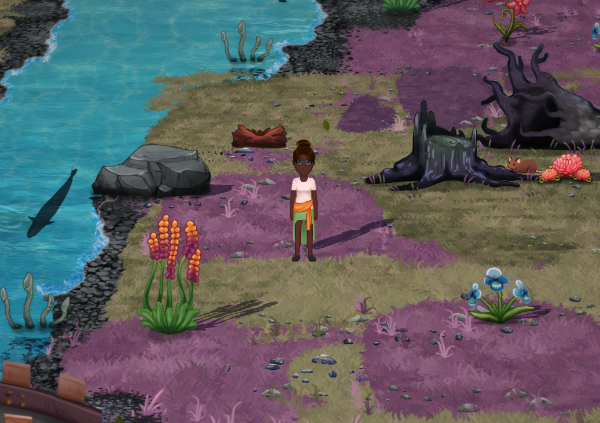 The flora and fauna were redesigned, and an overhaul of the roads has really helped tie the world together visually. 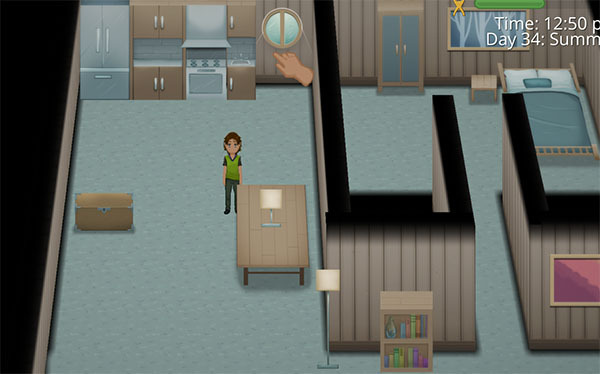 In addition to the exteriors, the interior placeholder art has been replaced with tastefully designed rooms and accents that the player can customize as they please. The NPC art has been updated again as Lizzy strives to find a cohesive rendering style for the characters. We now have four fully rendered characters in a consistent style and are working on additional emotion portraits to accentuate the dialog. 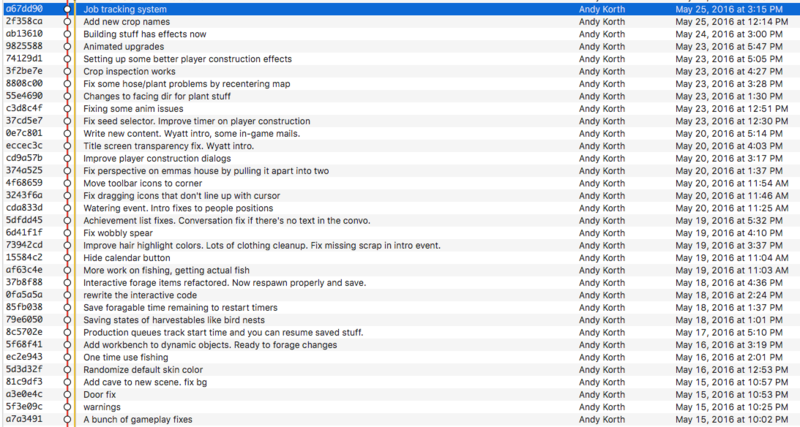 Our recent closed playtests have provided a great perspective on what we've accomplished, and what still needs work. 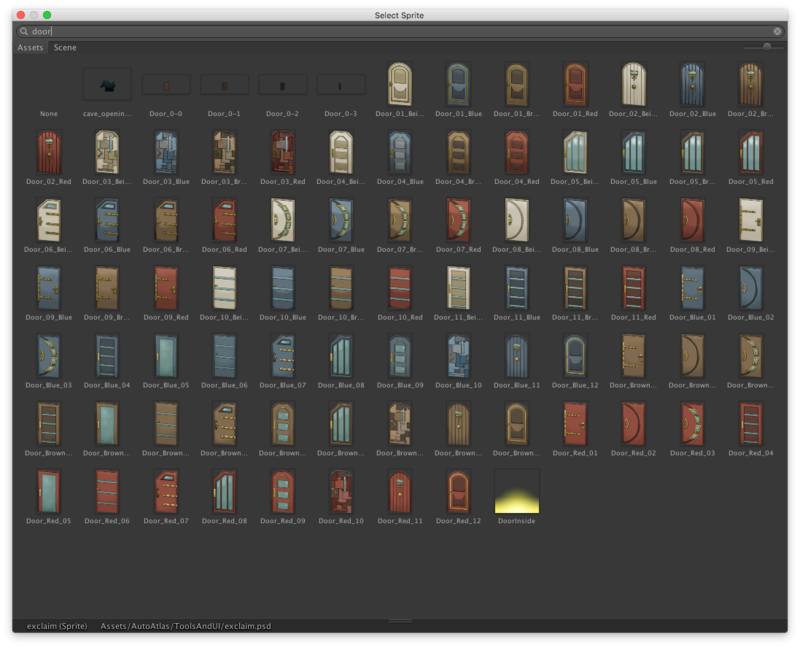 The new interior art allows players to move, replace, and eventually recolor all these items of furniture! Since 2D Con, the entire intro has been rewritten for clarity and to increase player involvement. 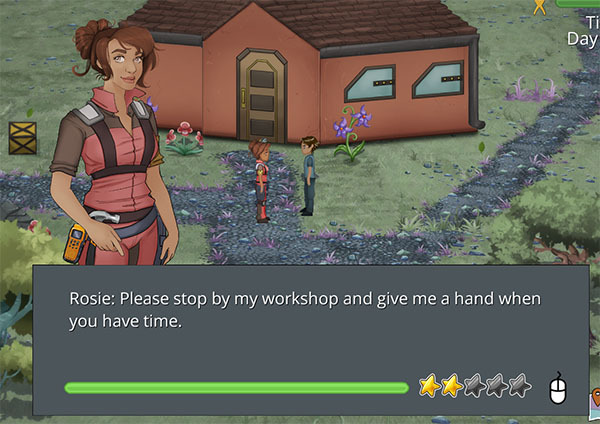 Beth has also been hard at work creating more relationship events for the first four non-player characters. We also have new daily dialogs for them. 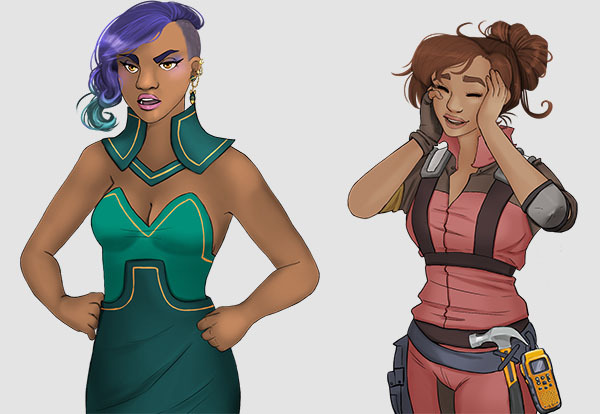 The bios for the next two NPCs are in the works as well, and the visual descriptions have been sent to the artist. Hopefully by Gamer's Rhapsody we will have the friendship events and daily dialogs for the first six NPCs completed to allow for a more robust experience. The UI is probably going to continue to change, but we've moved to a simpler and cleaner style for the interface. Tool upgrades! Each standard tool now has three different upgrades. The upgraded versions are faster and use less energy, but they also can be used to access different areas, or farm in more difficult terrain. There are two secret tools you'll unlock as you progress through the beginning of the game. 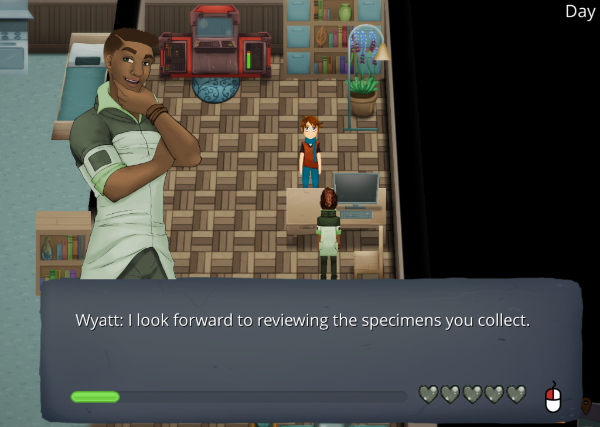 We're now on Steam Greenlight, and we need your votes to get Verdant Skies listed on Steam! Please vote for us on our Greenlight page. Voting is free, you just need a steam account, and the more "yes" votes we get, the sooner Verdant Skies will be on Steam! 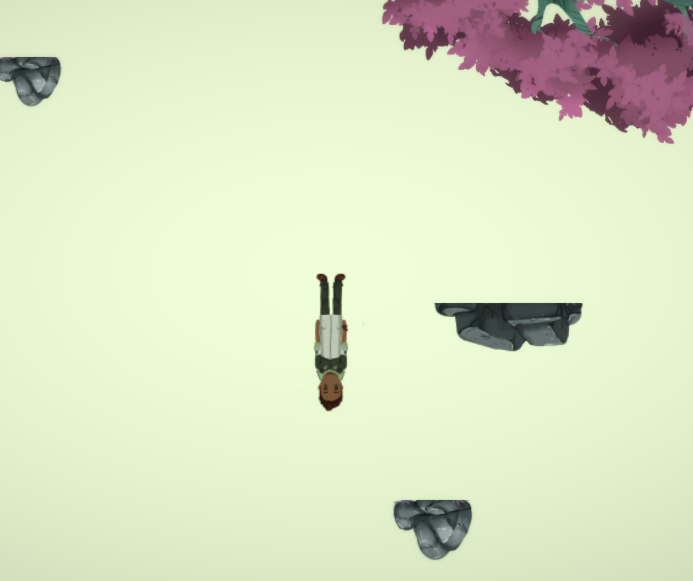 Our new video shows off all sorts of new things you can do in Verdant Skies. 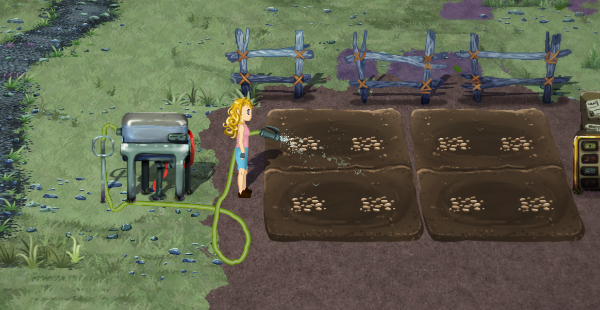 Check out the upgraded fishing system, the crafting systems, planting, watering, and harvesting crops. Big advancements have been made to our furniture system. 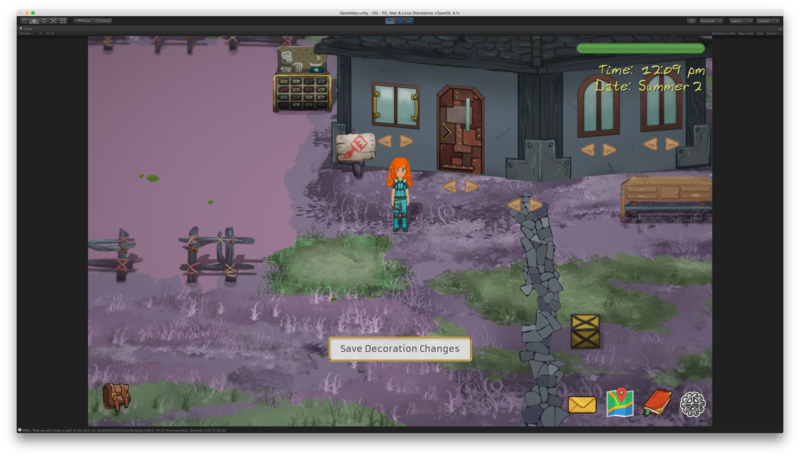 Now your paintings will automatically snap to walls, and certain small objects can be placed on top of tables. We've also updated the shop, so you can purchase decorative rugs and interior windows to make your house really feel like a home. 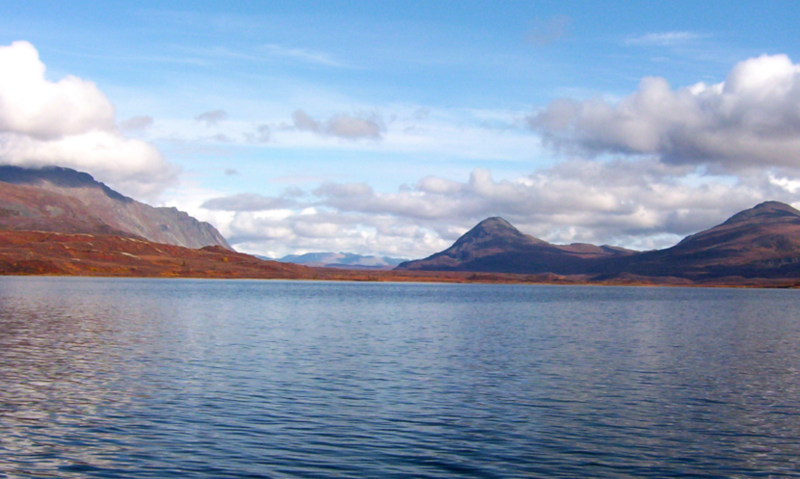 This picturesque lake is just west of the town center. You can build the western town expansion from this area, which adds a roadway and new building sites for more colonists. Thanks for your Greenlight Support! Verdant Skies has been successfully Greenlit on Steam! We are deeply grateful for all of your votes and support; thanks to you, our game will be available on Steam when it is done. So much has changed in the last month, it's hard to make a list. We've got a new flexible clothing system that allows you to combine dozens of different shirts, pants, skirts, and accessories. The map has expanded to include the eastern side of the river, which includes a new lake where you can harvest clay for your pottery. The color theme of the eastern bank gives the new area a pretty different feel, it transitions from the green grass on the west side towards a purple theme. New character art and new map areas! The crafting system has been overhauled- many new items have been added, but we've also cleaned up which items get crafted at which station. The 3D Printer is used mainly for crafting objects that have a specific gameplay purpose or can be used to craft other things. The 3D Printer can queue 5 items at a time and things generally take the better part of a day to print. Contrast that with the woodworking workbench, which is used mostly to make decorative items for your home. Items take a few hours to make at the workbench, but it actually consumes the your time to make these items. If you find yourself with time left over at the end of the day, use your time at the workbench, artist easel, or in the kitchen! Without using energy you've reserved for chopping wood, you can make a tidy profit or restore some energy with a homecooked meal. 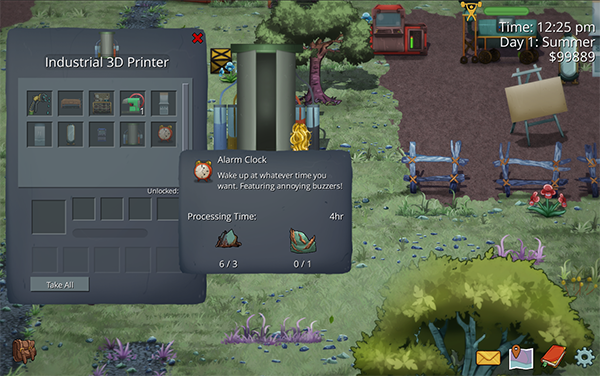 One of the new craftable items is the alarm clock, which allows you to nap anytime you want and wake up at the time of your choosing. The pottery station provides 50+ decorative options for your home, plus the possibility of a steady daily income. More and more interior items are being added. Once you invite Miles to the planet, you'll be able to buy flooring, wallpapers, windows, and recolorable rugs. Change the flooring and wallpapers of your home... with a fancy animation! The genetic engineering UI has been reworked again in order to improve the usability. There isn't really anything else like this that I'm aware of, so it's taken a lot of redesign to make it easy to use. The big usability fixes in the latest changes to the genetic interface have focused on immediately showing the effect of your splice location. You'll be able to label/mark your seeds, so you can keep them sorted easily. The UI will probably go full-screen to better fit the resulting traits without needing to scroll. The below picture shows the combination of two seeds with some positive and negative traits. 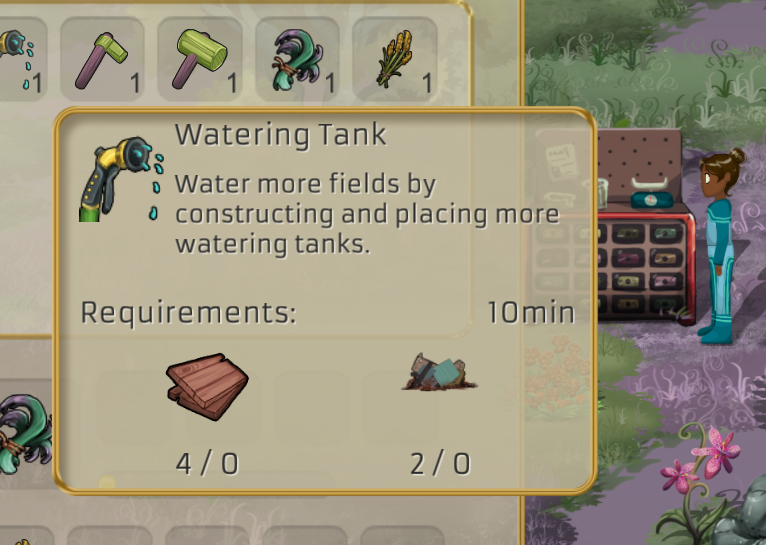 Notice that one of the two genes that code for "Needs extra water" overlap with the quality trait. We could move our splice point to remove the last blue gene, but that would eliminate both the positive and negative trait. But we did get the necessary regrowth gene out of the bottom seed, and that's one of my favorite traits so far. The new Genetic Splicer is also red/green colorblind friendly by default. There are also a dozen events for the first four characters. Wyatt likes to request plant samples from new areas of the planet. New watering particle effects and new outfits! If you're in Minnesota, stop by the Gamer's Rhapsody conference to play a preview build! The convention is this weekend, November 18th - 20th. We will have a booth at the Gamer's Rhapsody Indie Developer room. Also, you can use the coupon code "GR3" for a discount on admission. If you're a student, use "GRstudent" for even cheaper tickets!